WASHINGTON, D.C., NOVEMBER 6, 2018 — Methane gas released from landfills has long been a topic of interest for alternative energy. One issue, however, is that landfill gases contain numerous contaminants, such as volatile methyl siloxanes, whose silica deposits put extra wear and tear on the natural gas generators when they combust. One group has demonstrated a promising new application of plasma technology capable of removing such compounds. 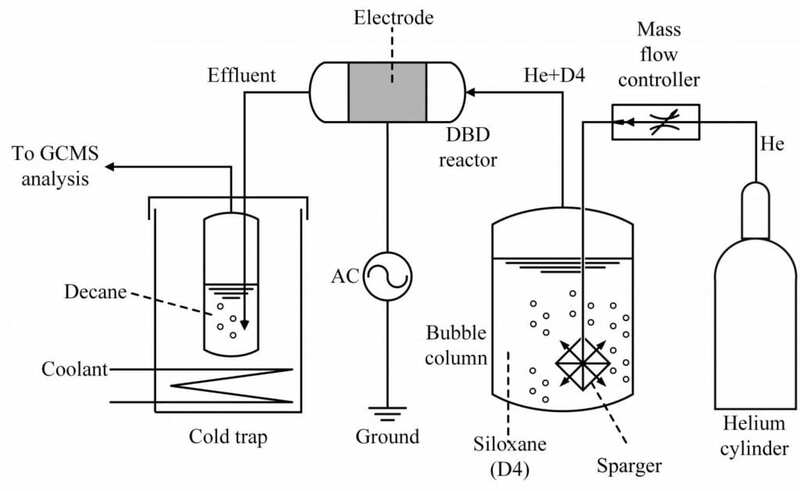 Researchers at the University of South Carolina in Columbia have demonstrated an experimental plasma device capable of cleaning gas samples of D4, one of the most common siloxanes. Drawing on a technique for creating plasma called dielectric barrier discharge, the group was able to significantly reduce the amount of D4 samples after treating it with a helium-based plasma. The findings point to a new potential solution for accommodating landfill gas rich in siloxanes. They will be presented at the American Physical Society 71st Annual Gaseous Electronics Conference and 60th Annual meeting of the APS Division of Plasma Physics, which takes place Nov. 5-9 at the Oregon Convention Center in Portland. "This is the first time dielectric barrier discharge has been used to remove volatile organic silicate compounds," said Malik Tahiyat, one of the researchers involved with the study. "In our case, there's no wait for removing it or material that has to be thrown out after a certain amount of time." Silicates erode the engines that drive natural gas electricity production, requiring extra costly maintenance. Most current methods of removing them from cleaner burning methane, such as carbon filters and silica gel, suffer from diminished performance and can be costly to reuse. The group created a dielectric barrier discharge plasma to render D4 inert by polymerizing it out of the gas phase. Helium gas was bubbled through liquid siloxane, which is then passed through a tubular dielectric barrier discharge plasma reactor. Samples that were treated with electric discharges were compared to samples that were not. Gas chromatography-mass spectrometry and nuclear magnetic resonance techniques were used to evaluate the quantity and identity of the products from the plasma reactions. Depending on how long the helium with D4 was exposed to the plasma, up to 85 percent of the D4 was converted to removable deposits of silica compounds, confirming that the silicon was removed from the gas mixture. "Our findings have shown that plasma can remove siloxane successfully," said Shamia Hoque, another researcher involved with the study. "When it is removed, it comes out in a form that wouldn't re-enter the waste supply, something that's a problem with the other approaches." Tanvir Farouk, a third researcher involved with the study, said the group hopes to improve on the laboratory-based system with the hopes of one day scaling it up to a commercially viable product. We will grant free registration to credentialed journalists and professional freelance journalists. If you are a reporter and would like to attend, contact Rhys Leahy or the AIP Media Line ([email protected], 301-209-3090). We can also help with setting up interviews and obtaining images, sound clips, or background information.